This is the nutrient that the body uses to build and repair tissues such as muscles, blood, internal organs, skin, hair, nails, and bones. They form a part of hormones, antibodies, and enzymes molecules. This nutrient is necessary for normal functioning and, also helps maintain the normal balance of body fluids. The main sources of this nutrient are meat, milk, and other daily products. Excess amounts may be converted to glucose or fat or even excreted through the urine. The human body uses 20 amino acids. These compounds are made up of nitrogen, carbon, hydrogen, and oxygen. Out of the 20, nine are called “essential amino acids” because the body cannot produce them. The other eleven are “nonessential amino acids” because they can be manufactured in the body if the foods in our diet provide enough nitrogen. To make what it needs, the body must obtain enough protein-building blocks from food sources. 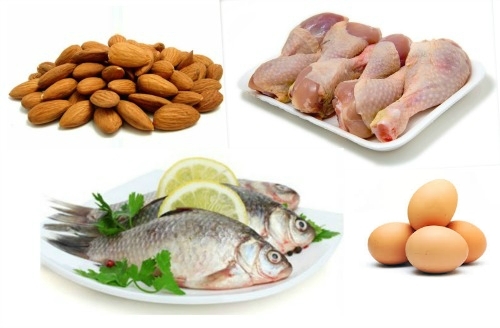 The best food sources include eggs, meat, dairy products, fish, nuts and legumes. Grains and vegetables also provide some some amounts, but not in plenty as the above sources. Animal foods are the most preferred sources because their amino acids are in the right balance. Plant foods have low levels of one or more of these compounds. People who do not eat animal products should eat different types of plant foods together or within the same day to get balanced amounts. For example, combining beans and rice, beans and corn, or peanut butter and bread can provide essential amino acids in their right amounts. How Proteins are broken Down into Amino Acids? When foods containing this nutrient are eaten, the body takes the large protein chains from them and breaks them down to either individual amino acids or dipeptides before they are absorbed. After being absorbed, amino acids are transferred through the bloodstream to those tissues that need them like muscles. The body uses amino acids to rebuild its own form that is needed to support tissue growth and repair. The breaking down of this nutrient to amino acids is facilitated by enzymes called proteases. Proteases help to cut down between particular amino acids thus producing smaller peptide chains. This nutrient must first be untwisted before proteases can act on them. This untwisting process is called denaturation and produces a long single chain protein. Denaturing takes place in the stomach and is made easy by hydrochloric acid (stomach acid), protease pepsin and the mixing mechanism in the stomach. After being denatured, the long single chain is transferred from the stomach to the proximal small intestine (the duodenum). Here there are several kinds of proteases that breaks down the long chain to produce dipeptides and single amino acids. These two products are then absorbed in the small intestine, via the jejunum (middle section). A healthy adult requires around 40-65 grams daily. This requirement must be met by the foods you eat; otherwise the body breaks down tissues to get the amino acids it needs. A deficiency of amino acids leads to poor muscle formation, poor functioning of immune system, fragile and thin hair, and stunting among other symptoms. Plant and animal food provide amino acids in large molecules that have to go through denaturation process in the stomach. Protease enzyme in the intestine also acts on them further before they are absorbed. Most of the processed foods provide hydrolyzed protein. This form has already been broken down chemically into smaller chains, from two to 200 amino acids known as peptides. Peptides do not require denaturing and hence they are easily digested. However they have to be digested in the intestines since they are too large for direct absorption. An exception for digestion is the special food for hospital or healthcare use. These are usually made of elemental amino acids, thus they provide amino acids themselves. For this reason they do not need digestion before absorption.